At least five jihadists from Sweden have died in clashes in Syria during 2013. One of them was Yassin Ben Salah (picture above), who founded the taxpayer-funded immigrant organization “Pantrarna” (The Panthers) in Göteborg. According to editorialist Per Gudmundson from newspaper Svenska Dagbladet, who has been mapping out the dead Swedish jihadists, Yassin Ben Salah travelled to Syria sometime around the middle of October last year. He was killed just over two months ago. 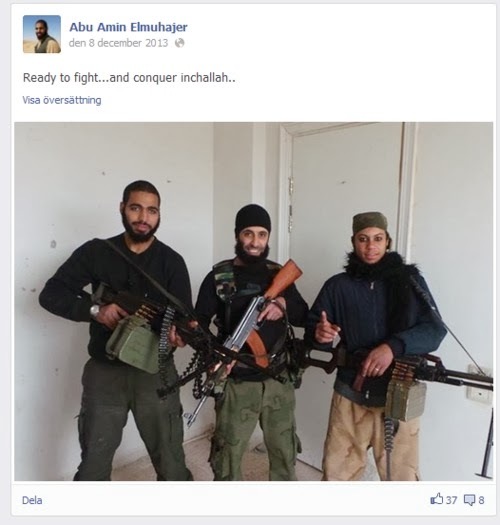 The last photo posted on Yassin Ben Salah’s facebok page on December 8 last year showed him fully armed. He affirmed that he was “ready to fight”. Yassin Ben Salah posing with other jihadists in Syria – 2 weeks before his death. “The panthers will never forget you, brother” and “I hope you get everything you wanted in paradise, you martyr of ours!” – two of the comments which were posted at the social network site after he died. 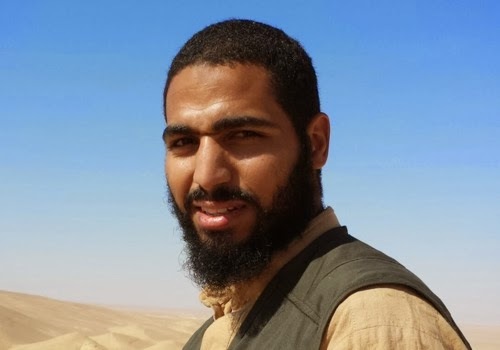 Yassin Ben Salah co-founded the organization “The Panthers” in Gothenburg in 2011, and before starting to wage jihad, he worked as a "strategist" and as one of its front men. He had been highlighted many times in the media - Expressen and Metro - as a leading figure of the extreme left organization. The Panthers, which just like its sister organization Megafon from Stockholm, claim to work for "the rehabilitation of the suburbs", got huge media attention in relation to the nationwide immigrant riots which took place last spring. Their name refers to the American militant anti-white communist organization Black Panthers. The activities of “The Panthers” – an organization with criminal records - were financed with hundreds of thousands of kronor from the Swedish tax payers. Welcome back CZ. Hope you keep blogging. This blog is very useful. I celebrate your return. I was worried you had been silenced by the PC Police intent on removing all opposition. Why are these vile creatures in Sweden in the first place? There was NOTHING wrong with Sweden's demographics that it needed to be flooded with Third-World savages. Shame on the government for its blatant RACISM and GENOCIDE against native Swedes. Sweden didn't need him.Theres no room for the middle east in europe.I hope western civilization gets its countries back from the sand people. Good News,..Hope that the Syria armies get the victory, soon!! Good riddance. Hope more of these "Swedes" get killed in Syria. Welcome back. The internet was a duller place without you. They aren't Swedes, they are Muslims. Muslims can never be a European and they have Jihad, We have war... lots of guns, etc. We out number you world wide. Islam was made by a Catholic Bishop to conquer Jerusalem. There's no paradise but they do have a hell for being PURE EVIL. "Islam was made by a Catholic Bishop to conquer Jerusalem." Islam is derived in part from some Judaic teachings, practices and texts (mishna, gemara, the Babylonian Talmud) and these include amongst others: death for apostasy, a social/legal system discriminatory against non-adherents, 'hate' speech, dissimulation in speech to non-believers and paedophilia (female children above the age of 3 years and 1 day, and male children below the age of 9) . Amongst the earliest followers of Mohamed were formerly Jewish rabbis and some of the tafsirs (exegeses) were compiled by Jewish converts to Islam (these tafsirs are called 'Israilyat' (of Jewish origin) and are part of the Traditions in Islam). One less semite devil worshipper.